Posted on Wednesday, March 8th, 2017 in Commonly Asked Questions, Engagement Rings, Informational. 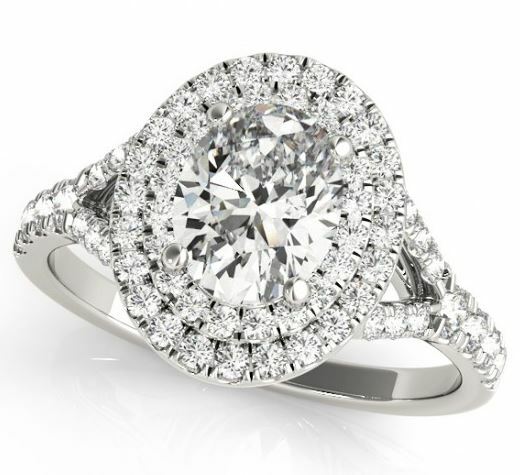 What’s it like to shop for an engagement ring at Kloiber Jewelers? Shopping for an engagement ring at Kloiber Jewelers is stress-free, easy, and enjoyable (at least that’s what our clients like to tell us). Most of our engagement rings are custom made, which means we’ll work with you to create the exact ring you’re looking for. Whether you already know what that ring will look like or are starting from scratch and need a little guidance, we’ll be there throughout the entire process to offer our expertise so that you leave our store with an engagement ring you can be proud of. It’s always nice to come in with a budget before purchasing an engagement ring. If you’re set on a specific type of ring, we’ll work within you’re budget to make sure you end up with the ring you want at a favorable cost. Do you have any in-stock engagement rings available or are they all custom made? We do have quite a variety of rings that are available to purchase from our in-store cases. However, we find that most of our clients like specific aspects of certain rings and want to combine those various features into one perfect ring, which is where the custom design process comes into place. How does the customization process work? First, we’ll work with you to find or design the perfect ring setting. This may entail showing you a computer-aided design (CAD) or a wax carving so that you can get a better idea of what the ring will look like when it’s completed. Next we’ll contact our go-to diamond/gemstone suppliers and order at least three diamonds (or another gemstone) that match your quality specifications and/or designated budget. You’ll then come into our store to look at the diamonds/gemstones in person (with no purchase obligation) and decide whether any of these are “the one.” After we’ve selected the perfect setting and gemstones we’ll have our goldsmith begin working on your engagement ring. How long does it take to customize an engagement ring? Our custom design process (from initial consultation to having the engagement ring in your hand) usually takes anywhere from 2-6 weeks. Depending on your timeline, we can always speed up or delay the process. Do you offer insurance on your engagement rings? As long as your ring hasn’t been met with an extraordinary mishap, we’ll replace any missing diamond accents (or any other small gemstones) at no charge. We also offer complimentary ring cleaning services whenever you want it and will check your ring to make sure all of your gemstones are secure. We recommend insuring any large gemstones with Jewelers Mutual or another insurance agency of your choice and we’ll work with you throughout this process to make sure you find the best insurance possible. Why should I choose Kloiber Jewelers over another jeweler? At Kloiber Jewelers, you’ll receive the utmost quality of care. Every client gets to work with owner, Karin Volz, who has over 30 years of experience working with engagement rings. After gaining some insight into the type of engagement ring you’re looking for, Karin will spend countless hours searching for the best quality, most affordable gemstones and ring settings. Kloiber Jewelers has been in business for 91 years, and throughout those years we have established a strong, long-standing relationship with our diamond and engagement ring suppliers, so you can rest easy knowing that you’re not only getting the best care possible, but you’re also getting the best value at Kloiber Jewelers. Call us at 414-276-2457 or email us at info@kloiberjewelers.com to set up your engagement ring consultation appointment. Click here to see some of our engagement ring samples.